We love our pets, don't we? They become a part of us. A part of our family. For some of us, they are the only family we have. It's no surprise that when we go camping, we want them to come along with us for the adventure. If you are in a campground, rules will definitely be in place saying your dogs have to be restrained in some manner. Often, they are not permitted to be left outside on a tether. In such cases, a portable dog playpen can come in handy. Dog playpens come in large and small sizes to accommodate almost any breed or size. Even the best dog playpen is no substitute for proper walking. Why A Playpen Or A Crate? These pens can make the chore of potty time easier for you as you can let them out in the playpen area to relieve themselves instead of walking them on a leash until they go. Still, we cannot stress that you give your dog plenty of walk time as it is the key element in taking care of your dog's basic needs as an animal. The most essential ingredient to a happy and mentally stable dog is plenty of exercise. When you are camping in a campground, there are DEFINITELY going to be rules against allowing your dog to roam free. This is, of course, for the safety of your dog and for the safety of other dogs plus the people in the campground. No-one, and we repeat, NO-ONE likes when a strange dog comes bounding up to them, sniffs at their crotch then proceeds to pee all over their stuff, or just be a general annoyance. Dogs also don't appreciate other gregarious dogs running up to them either, leashed or not. These things can cause a dog fight and/or a human fight to break out. Therefore, you need to keep your dog contained, be it on a leash or in a playpen or a fenced in area. If you are boondocking, you can likely allow more freedom for your pet. These types of dog playpens can also be used at home. They can be used to teach a dog to go potty in a certain area of the yard. You can also use them indoors as a place for your dog to sleep, or to contain them when guests come over, or for whatever other reason you may need it. These pens should NEVER be used as a form of punishment. Dog playpens can go by different names: puppy playpen, outdoor playpen, portable dog pen, and portable dog runs, for example. They all serve pretty much the same purpose... to keep your pet contained with a bit of wiggle room. An indoor portable doggie playpen is going to be made out of materials that should not get wet. There can be hybrids of this, of course, you just want to be sure you don't use one outside that can rust, or that is made of non-waterproof materials. 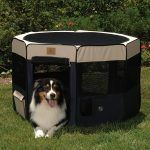 People usually use this type of playpen for dogs to keep their pet safe from harm, from destroying something in the house, or for them to use as a sleeping place or a den, feeling safe and secure. Leaving your dog in your RV for the first time can be pretty traumatic for them if they are not used to living there. Because they don't know where they are and when you leave, they don't know if the routine of you coming back applies to this new space. To a dog, you are their pack. If that dog feels that they are the pack leader and you leave, your dog thinks they were just separated from their pack. This dog will do anything to get back to you, their pack, if they think they have been abandoned in a foreign place i.e. your RV. How can they possibly know that you are coming back? This creates separation anxiety and sure, your loyal dog will possibly try to tear the RV apart to get out. Having a place that your dog knows and is comfortable living in will help them to feel safe and secure in your RV or tent. If they have a space at home, like a crate or small pen, then you can have it in your RV as well. 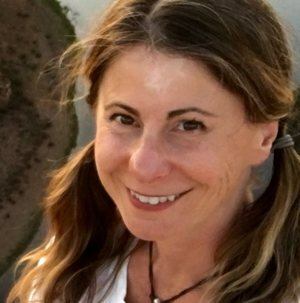 Because you come back when they are in their little personal space when at your home, then they could connect that you might also come back when they are in their bed area in your RV. Having an indoor dog playpen could also be a good place to put your pet(s) when they come inside after it has been raining. This little area will let them dry without getting your RV wet and dirty as well. If you have gregarious dogs when guests come over, a playpen for dogs is a good way to keep them under control. This is also good if you have guests who don't like dogs. Simply put them in their playpen. People also use these pens for their cats. If you have a playpen at your home for a place of rest or playtime for your kitties, and you decide to bring them along camping, they will appreciate the familiarity of having a place to call their own in your RV. I, Kelly, was shocked. These are very happy traveling kitties. This type of pen should at the very least be water-resistant. Waterproof would be a better playpen material for longevity. You can get a portable dog fence to let your dogs do their business outside of your RV or tent, or it can just be a place to let them watch the goings-by in the campground. They can possibly stretch their legs in the dog fence a little depending on the size of the enclosure you purchase as well as the size of your dog. ​If you buy a portable dog pen for outdoors that can rust, you can bet your bottom that it will, over time. Eventually, it will fail, while potentially causing your dog harm if they get caught on a damaged section of your rusty pen. Even worse, they could escape and get hit by a car or someone might decide to keep them if they find your cute little dog. Just find portable dog fencing that is not going to rust, gives your dog the room you intend for him to have, and allows them to enjoy the outdoors without being on a cable where they can get all tangled up. That's no fun for them or for you. If you get a puppy, whether you are camping or not, it's a good idea to have a puppy playpen for them for a few reasons. 1. You can use a bottomless one to teach them where to go in the yard. ​If you are taking your puppy on a camping trip, you are going to need a portable pet playpen for the same purposes. You don't want them to poop all over or tear up your RV. Never mind me. Just doing my thing. Having a place to sleep that is familiar to your puppy is also a good idea, whether it's your playpen or another bed or crate. Dogs in general like having a regular schedule. It's especially important to have your puppy on a potty schedule so it learns to go outside on a regular basis. You cannot just buy a portable pet playpen or a crate for your dog, stick them inside, walk away, and expect them to not cry and want to get out. For all they know, they just got stuck inside a box and will never be able to get out. To them, they likely believe that they will never get out and will die if they don't escape. Survival instinct is healthy and it's a natural reaction to being stuck in a small space. ​Now that you know the types of uses a pet playpen might be good for, it's time to decide how exactly you will be using yours. You can hardly go wrong as these things aren't super complicated. Still, picking the right one will likely make your life a little easier now and down the road. Let's look at the how's and why's behind why you may or may not want some of these features. This is a big one. Does your pooch chew to get out of a crate-type environment? Will it be an inside or an outside dog playpen? If you have a chewer, you will not be able to get a soft-sided playpen or your dog will likely destroy it. If you are using it outside, you will need it to be a waterproof material. Plastic: Good for outdoor use as it won't rust. Lasts a long time. Dogs may be able to chew through if it's a large dog. These pens are pretty good about not scratching delicate floors. Metal: This is the most rugged type of pen you can find. If you have a dog who chews, they will have a very difficult time eating this gate. These are ok for outdoor use, depending on the type of metal the pen is made out of. Look for metals that have been coated to protect against rusting. Polyester and Mesh: Playpens that are made out of material are typically made from polyester with mesh 'windows'. The bottoms of some are waterproof so if you use it indoors and your pet has an accident, it will stay contained. This material is obviously destructible and will be of no use if your pet hates to be contained. If you have a jumper, these can work well because some of them come with a zippered top for full containment. Most portable dog playpens aren't gigantic. One COULD purchase more panels for some models to make a larger pen, but if you are in a campground, your space could be limited anyway. 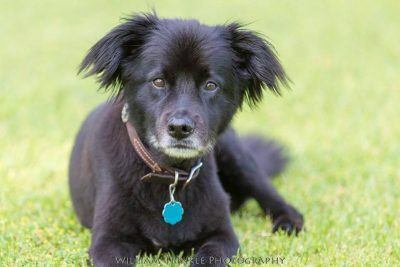 Consider if you are going to have your pet contained by the gates the second he goes out the door of your RV/tent, or if you will have the pen in a circular position standing on its own. If you are trying to make a fence surrounding your door, you may need a few more panels. Most dogs will want to be as far away from home as possible to go to the bathroom. If you have large dogs, of course a portable dog run with 4 panels won't be large enough. Your pet should at least be able to sit, stand and turn around with a little room no matter what use you are getting it for. If you want them to relieve themselves​ in the pen, they will want a lot more room than to just be able to turn around in it. They want to get away from their excrement as quickly as possible, and not have to step in it right after they have done their business. That is the question. Well, if you have small dogs that are easy to pick up, maybe no door. But remember, if they are using the bathroom in it, you are going to have to go into the enclosure to pick it up. If the panels are not easy to take apart, you will want a door, depending on your physical health and the height of the panels. If you have a large dog, you will probably want a door. Keep in mind that most doors have a 'lip' at the bottom for stability. If you have teeny tiny Yorkies, the lip should be small enough for them to get over it. Also, dogs' feet can get caught in the lip, so be careful if you are trying to pull them out of a metal crate with a lip at the bottom. Not going to have a problem with a door lip. Where will you store the portable RV dog fence while you are on the road​? Also how much does it weigh? Most don't weigh a lot, but if you are near your RV's maximum weight, you may have to keep it on the lighter side. Some people store their portable RV dog fence in their tow vehicle. 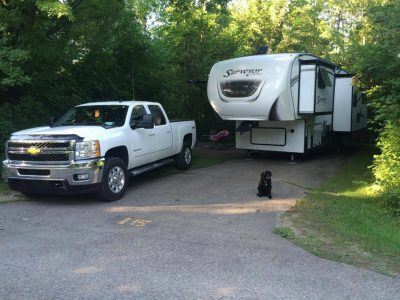 Others keep it right inside of their RV or camper until they get to their destination, immediately setting up 'shop' for their pup upon arrival. Then there are the people who have attached a carrying area in the front or the back of the outside of their rig. Storage probably isn't a huge factor here unless you are toting Great Danes around with you, hence huge and heavy pens. Keep in mind a few things while you are using your playpen outdoors. Presence: First, it's not a good idea to put your babies out in the portable dog fence then go inside and take a nap. A lot of bad could happen. What could happen? Well, your babies could be stolen out of the portable dog playpen. If you have very small dogs, a bird of prey could make away with them. Your pup could dig and get out. Some kids could come along and do something mean to your babies, or feed them some chocolate. Their collar could get caught on the gate if they tried to jump out, hanging them to death. Or, someone could reach into the pen to try to pet your dog and they could get bitten. It could start raining on them. It could get super hot outside leaving them vulnerable to heat stroke. We could go on. We're not out to scare you here, we're just being honest. These are just a few things that could happen. It's just not a good idea to leave them out in a portable dog pen unattended for any length of time. You could be risking a lawsuit. Or worse, their life. Be careful when you are using your outside dog pens. Indoors: If you are using the dog pen indoors for a place to play and/or rest, keep some blankets and toys in there for them. Also, they should have access to water in their pen so they can drink at will if they will be there for quite a while. If you have a puppy or a dog that is puppy pad trained, you CAN put a pad in the portable dog fence area, but only if it is large enough for them to get away from it. If you force them to 'go' and then have to stay near it, it may dampen their natural instinct to not go in their bed area, making it that much harder to potty train. Taking your dog or dogs with you camping can be a rich, rewarding experience. Our pets become part of our family, so it's natural to want to bring them along with us. Having a dedicated space, indoors and out for them to have to themselves is an important part of having them on the trip. Keeping them safe with an outdoor dog playpen, away from other dogs, is a great idea and keeps the leash at bay until it's time for their daily walk. Remember, exercise is the #1 ingredient to keeping a dog mentally healthy. Even small dogs need this activity to stay sane and balanced. A small outdoor portable pet playpen is NO substitute for daily walks. Portable RV dog playpens are best to have for your dog's chill time and/or to let them be outdoors while you are staying in a campground OR at home. Get out there with your best friend, get a portable dog fence for camping, and camp as long as you can! Next, we show you the best playpens we found and why we think that they are a good bet. There are a few different types of portable dog playpens out there. Picking a certain type of material will greatly depend on the personality of your pet when in an enclosed space. If you have small dogs, you may need a roof to protect from birds of prey. A metal playpen can be expanded. A soft sided pen is chewable. Take these things into consideration while shopping. The Precision Pet Soft Side Play Yard comes in small, medium and large sizes. 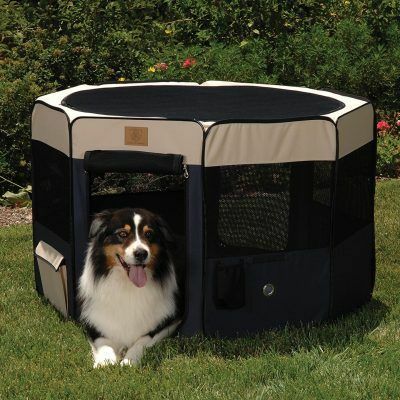 It's the perfect, totally enclosed portable pet playpen for your dog, cat or other pet to safely play in or rest. Each panel of the Precision Pet Soft Side Play Yard has a mesh window so your pet can see out of every side. It comes with a zippered top and bottom, so both are made to be removable. This allows you to use the area indoors, or outdoors for your pet to relieve his or herself in the yard. This playpen for dogs is very easy to move around because it is so light. It comes with a carry case for when it's not in use making it easy to store and to transport. User reviews are excellent online and the product comes with a 1-year manufacturer defect warranty. The small size and light weight of this portable dog playpen make it especially good for camping trips, canoe trips, hikes and more. It comes with reinforced corners, protected seams, and heavy-duty zippers which add to its hardiness. This portable doggie playpen also has a place to put a rabbit-style water dispenser. You can teach your dog to drink out of it. This eliminates the issue of your dog or puppy spilling their water if you choose to have water available. Or, yes, you can use this for your rabbits or any other kind of animal! All in all, this portable dog pen is a great way to give your pet a place to call their own. For dogs, it can be a play pen or a den for them to rest in. We love the removable bottom and top of this outdoor dog playpen so you can choose to use it in any manner that you so desire for your pet. Also, the bottom and top of the Precision Pet Soft Side Play Yard are zippered on as opposed to being held together with velcro. With velcro attachments, dogs have been known to escape. Just watch the video below for proof of that! This is really a great playpen for dogs. It has a softer feel about it, nicer than a metal playpen for dogs. The below video shows what can happen if you purchase a soft-sided dog playpen with a velcro bottom. Also, it's likely the dog's owner did not properly adapt it to being in the pen, therefore he is trying to get out. The ever popular Midwest portable doggie playpens have been around for over 90 years and they are well-known in the dog show and breeder worlds for their dependability. This portable dog fence for camping is made up of metal wire which has a coating of a black electro-coat finish that is rust resistant. This is great for if you want to use your portable pet fence outside. This metal dog playpen will keep your pet safe and contained while still allowing them some room to move around. Be aware that many campgrounds disallow dogs to be tethered outside on a line or a leash. With the MidWest MaxxLock Split Door Exercise Pen you will get 8 panels that connect by hinges, making setup and tear down the easiest possible thing to do. All you have to do is fold the panels down together and you're done. When setting up, the ends simply clip together with easy to use thumb clips. The panels of the portable doggie playpen are each 2 feet wide, and they are as tall as the height that you order for your pet (ranging from 24 inches to 48 inches tall). They connect to give your pet 16 square feet of living space. If this is not enough space for your pet, you can buy a set of two and connect the portable pet fences together. Optionally, you can connect a MidWest ACE folding dog crate to the Midwest portable dog fencing to give your dog both a place to rest (their comfortable 'nest') and to stretch their legs. This particular dog crate (available in multiple sizes) has two doors, so your dog can get into the fenced area, and you can let them out of the crate all together. This portable pet fence can be used for potty time, or as a little play area, or as a crate to contain them in while you are gone. If your pet tends to get destructive while you are away, a metal dog pen can be a good choice to minimize them destroying your things, and can instead, encourage them to sleep. Your dog can be kept happy and safe when enclosed (temporarily) inside of a playpen while you are camping. They can do their business here, or just use it as a place they can relax outside while you are at the campground. There's nothing better than bringing your furry friends camping with you instead of dropping them off at a kennel. They want to be with you, too! 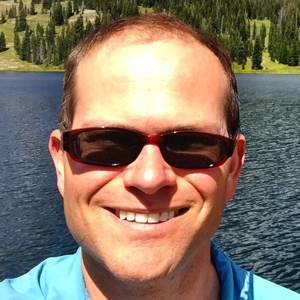 Excellent article and very informative! I am looking for a soft-sided pop-up style (or other easily portable) play pen/play yard for my little 4 pound Chihuahua. He goes everywhere with me, but there are times I do have to leave him, sometimes at a friend or family member’s house. When we do go camping, he goes along. He has a travel backpack that I usually carry him in, but have been looking for something bigger that I can bring with me. I hate to leave him too long just in his backpack. A google search of the best portable/travel play yards brought your site up, and I’m so happy it did! That’s great, we are happy you found our site! Are you going to get a pen for your chi then? I’m sure he will be happier in it than being a long time in the backpack. Hope you get to use it often because that means you are camping a lot. Enjoy!